The crowned hornbill (Lophoceros alboterminatus) is a species of African hornbill. It is medium-sized and reach lengths of 50-54 cm (20-21 in). The body is black to dark brown with a white belly. 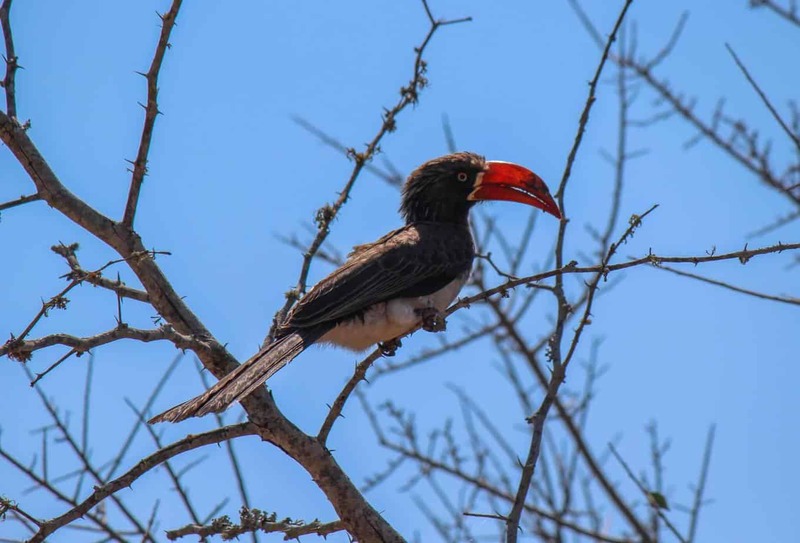 It has a bright red beak, with males having a larger casque than females. 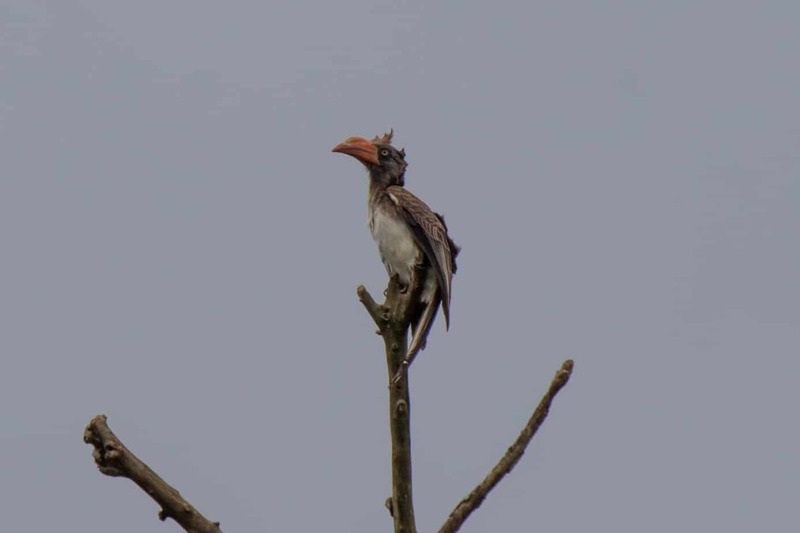 The casque is a structure on top of the beak commonly found on many hornbill species. It is less conspicuous on a crowned hornbill than on a trumpeter hornbill (Bycanistes bucinator), a species that shares much of the same range. 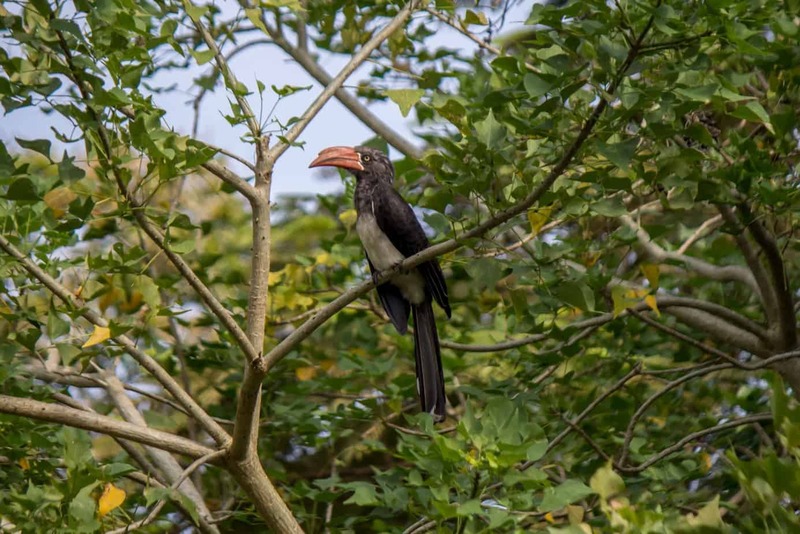 Crowned hornbills are often found in forests and sparsely wooded areas. 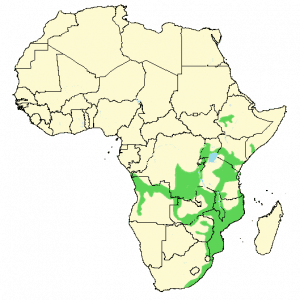 They are common in coastal and riverine forests along the east coast of southern Africa. They also frequent gardens and parks in urban areas. 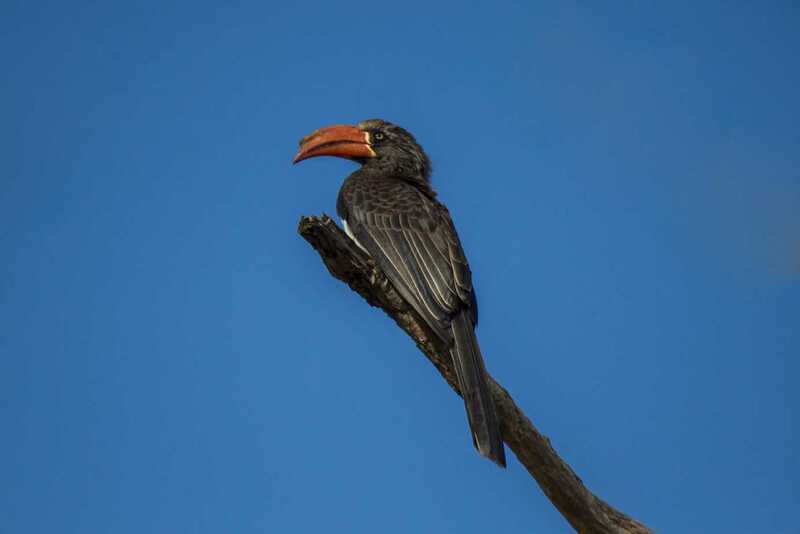 Insects and other invertebrates make up most of the diet, and crowned hornbills often catch flying insects, such as moths, in mid-air. They do also eat smaller reptiles, birds, and amphibians, as well as seeds and fruit. 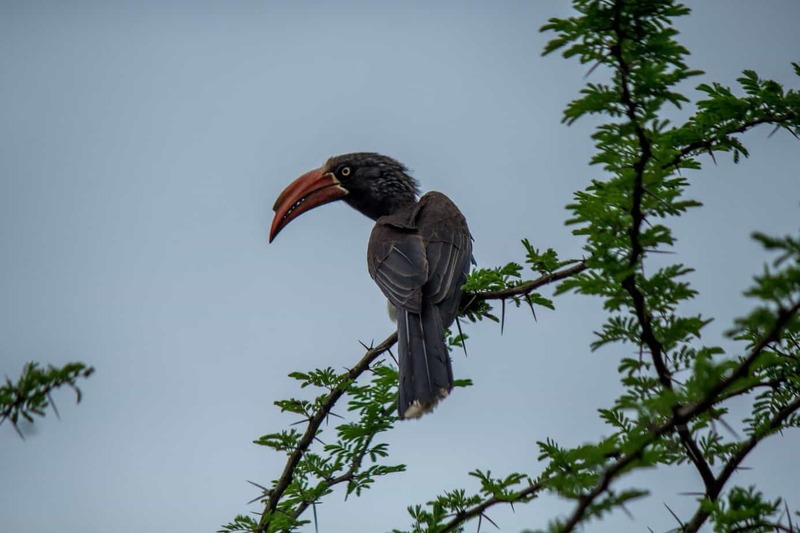 Crowned hornbills are often found in small to large flocks, and in some areas flocks can number up to 80 individuals in the dry season. 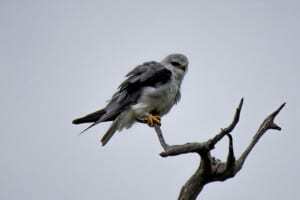 They roost in certain spots for two-three weeks at a time perched on branches open to the sky above. 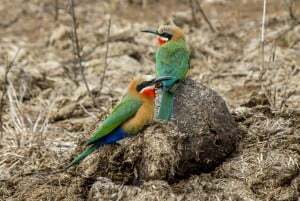 It is a monogamous species and mate for life. A breeding pair is territorial and will nest in a hollow cavity, often in a tree. The opening of the cavity will be closed up using droppings, only leaving a vertical slit to allow oxygen to the female inside while she lays the eggs. The male will feed her through the narrow opening during this period. Two to five eggs are laid and incubated for 25-27 days. The male will feed both mother and young in the period just after hatching. The mother will break out after a while to help feed the chicks. Parents and chicks remain as a family group until the next breeding season. The crowned hornbill is very common in its prefered habitat throughout its range and population is stable. 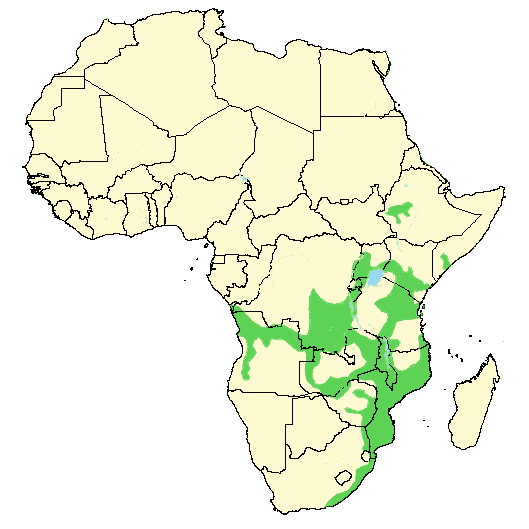 Some local populations might be threatened due to deforestation. There are no perceived threats to the species at large and it is listed as least concern on the IUCN Red List. My name is Håvard Rosenlund and I am a Norwegian guy in his late twenties with a love for wildlife, travel, conservation and photography. 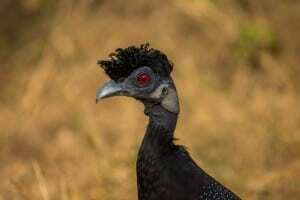 I have two years of experience as a wildlife researcher in Africa. However, my future was not to become a researcher, but to become a teacher, a mouthpiece, and an ambassador for wildlife by sharing my own experiences, my own love for wildlife and all the fantastic creatures I’d come across in nature.